Fibres from carrots and answering the difficult question of how to apply new materials to real world products. All over the world, research is being conducted into biodegradable and recyclable synthetics. However, components containing glass and carbon fibres are hard to recycle or make biodegradable. But within the scope of an EU research project, Scottish company Cellucomp has now developed a method to obtain nanofibres from carrot waste. These fibres would be both cost-effective and biodegradable. However, is the method, which works in the lab, also marketable on a large scale? This is a question entrepreneurs often face. Is it worth converting the production process to a new, ecologically better material? Empa has developed an analysis method that enables companies to simulate possible scenarios – and therefore avoid bad investments. Here’s an example: nanofibres made of carrot waste from the production of carrot juice, which can be used to reinforce synthetic parts. 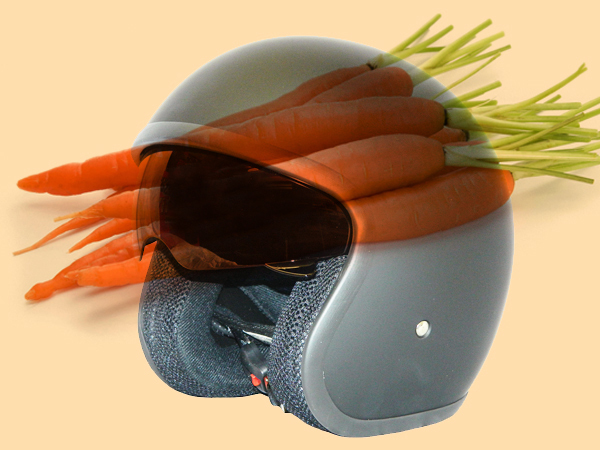 It is thought that nanofibres made of carrot waste might be used in the future for the production of motorcycle helmets or side walls for motor homes. A method called Multi-Perspective Application Selection – MPAS for short – developed at Empa helps identify the industrial sectors where new materials might be useful from a technical and economical perspective. At the same time, MPAS also considers the ecological aspect of these new materials. To clarify a new material’s market potential, investigators first look at the field of potential applications. The second step concerns the technical feasibility and market potential: can the material properties required be achieved with the technical process? Might the product quality vary from one production batch to the next? Can the lab process be upgraded to an industrial scale cost-effectively? Is the material more suited to the low-cost sector or expensive luxury goods? And finally, does the product meet the legal standards and the customer’s certification needs? In the third step, the ecological aspect is eventually examined: is this new material really more environmentally friendly for the products identified, once all the steps from product creation to recycling have been factored in? Which factors particularly need to be considered during production stage to manufacture the material in as environmentally friendly a way as possible? In the case of the carrot waste nanofibres, for instance, it turns out to be crucial whether five tonnes of fresh carrots or only 209kg of carrot waste (fibre waste from the juicing process) are used as the base material for their production. The issue of whether the solvent is ultimately recycled or burned affects the production costs. And the energy balance depends on how the enzymes that loosen the fibres from the carrots are deactivated. In the lab, this takes place via heat; for production on an industrial level, the use of bleaching agents would be more cost-effective. For fibre production from carrot waste, the MPAS analysis identified six possible areas worth taking a closer look at: protective equipment and devices for recreational sport; special vehicles; furniture; luxury consumer goods; and industrial manufacturing. Specific applications include motorcycle helmets and surfboards, side walls for motor homes, dining tables, high-end loudspeaker boxes and product protection mats for marble-working businesses. Similarly detailed analyses can also be conducted for other renewable materials – before a lot of money is actually invested in production plants.